Creating a digital loyalty program for their patrons. Giving people the opportunity to rate and review their beverages. Customizing the DigitalPour mobile menu system for their branding. We designed and built a digital loyalty-card system that has a similar look and feel to their brushed metal taps. 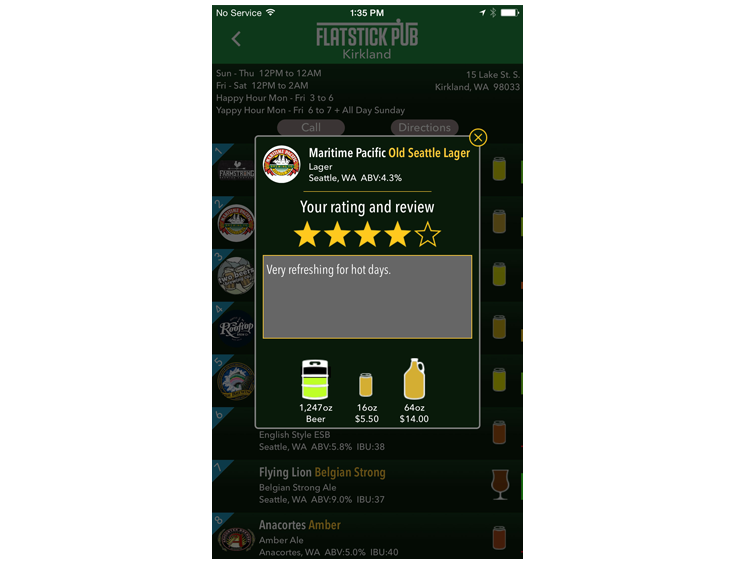 We expanded the DigitalPour menu system to include star ratings and personal notes about beverages. Every reviewed beverage counts toward the customer's punch card. We also changed the menu color scheme to better match with their golf-oriented branding. With an integrated back end and Admin area, they are able to find, adjust loyalty levels and add card punches for those patrons who are currently using their analog system. They quickly moved their Hall of Fame customers to this new system.